ThimphuTech was the first technology blog in Bhutan. We started writing it in 2009, just as broadband and mobile internet started to take off. (Although internet in Bhutan was launched in 1999, it was either super-slow or super-expensive, and was only used by a selected few). In the blog, we wrote about technology and food, but also about plenty of other stuff. 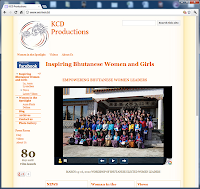 The blog became popular and influential in Bhutan. A companion bi-weekly column -- Ask Boaz -- was published for many years in the Kuensel, Bhutan's national newspaper. (The complete Kuensel columns are available as an ebook, Blogging with Dragons). We stopped updating the blog when we left Bhutan in 2014, but the information within the posts can still prove useful, and thus we decided to keep it online. We thank all our readers. I recently taught two batches of Rigsum's "Creating Websites" course. I have designed this fun, hands-on, two-day workshop in order to help individuals and organization create effective, secure and easy-to-update websites using a user-friendly technology called Google Sites. I started thinking about offering this training after hearing plenty of "website horror stories" in Bhutan: acquaintances told me about webmasters who took their money and disappeared on them, about stale websites that are all but impossible to update, ridiculously expensive hosting, hacked websites, and more. You might have heard similar stories yourself. After completing my course, participants are able to create their own efficient, clean, and search-engine-optimized website. They save the hassle (and money) involved in hiring a webmaster. Participants are able to update the website themselves whenever they wish. Their webpages are automatically backed up online, so they never have to worry about losing their data. Moreover, hosting is free - an additional savings of at least Nu 4000 a year. 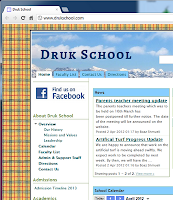 Ms. Kesang Chuki Dorjee (KCD Productions) decided she had enough trouble with her previous website. Following the workshop, she created the beautiful Inspiring Bhutanese Women website. Mr. Tashi Wangyel created GNH Builders, a website for his construction company. Customers are now able to find everything they need to know abotu GNH Builders, including forms, work progress etc. Other organizations in Bhutan using this technology include Druk School and our own Rigsum Institute, as well as internal DHI websites. I will be offering this workshop again on April 19-20, 2012. Seats are limited. You can find complete information on the workshop page. GNH Builders? I guess GNH has officially jumped the shark? I wish I had some time out of school to join you OR I wish you could share the presentation slides and handouts... I already like your course! When is it going to be? I'd like to join too I mean I can take leave from office if it isn't for many days. Please let me know the dates and fees. Comments are reviewed before being published, so it might take a few hours before you see your comments posted. Previously published Ask Boaz K2 tech corners are available here. © ThimphuTech.com. Simple theme. Theme images by tolgakolcak. Powered by Blogger.